NGC 7497 - Click to view larger image. Opens in a new window. NGC 7497 is a spiral galaxy similar to our own Milky Way galaxy and is seen from our vantage point edge-on. 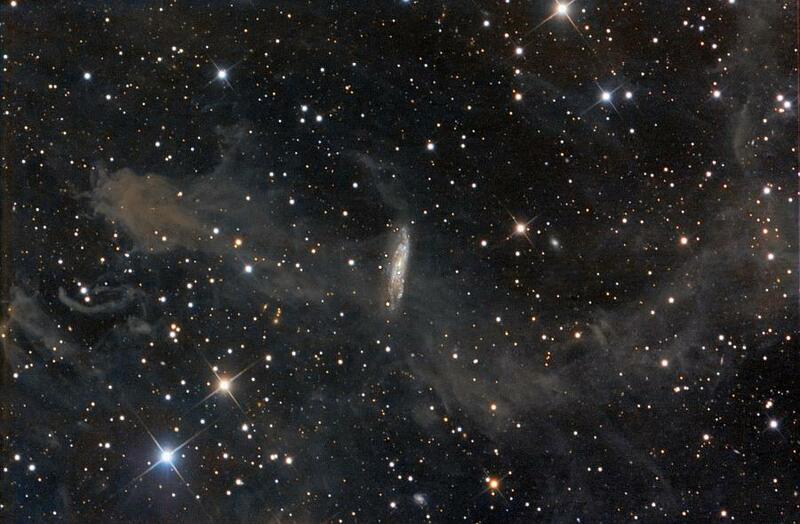 It lies about 60 million light-years away from us in the constellation Pegasus. Its distance makes it a bit tough to capture details of its disk and dust lanes with existing equipment. What adds interest to this part of the sky is the presence of the integrated flux nebula (IFN for short) that lies in our line of sight to the galaxy. This nebula is clouds of interstellar dust that floats about the plane of the Milky Way which reflect the combined light of all the stars in our galaxy! The particular ghostly segments of the IFN captured in this image are part of one cloud catalogued as MBM 54 and lie less than a thousand light-years from us.